All About Cabo Coupons are a collections of coupons from retailers in the Los Cabos area. Below you will find everything from Cabo San Lucas restaurant coupons to discounts at Los Cabos hotels. Also, we feature many discounts on activities such as sailing tours or spa massages. In order to redeem one of the these coupons, please either print the coupon or mention that you saw it here on AllAboutCabo.com. 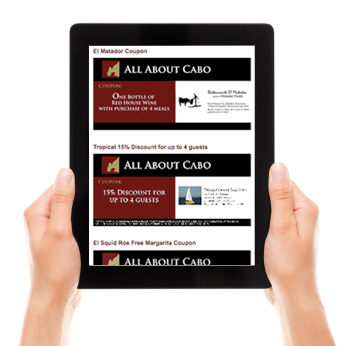 To print, please click on the All About Cabo Coupon you would like and it will open the coupon in another window for you to print. 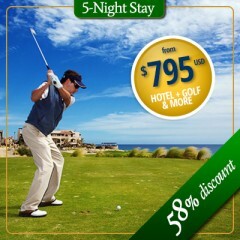 Golf at some of the finest golf courses in Los Cabos and save on your hotel! Package includes 5 Nights / 6 Days at Hilton Los Cabos or Melia Cabo Real for 2 Adults, 2 Rounds of Golf at any Questro Golf Course (Puerto Los Cabos, Cabo Real, Club Campestre San Jose), Private Roundtrip Airport Transportation, $100 Diamonds International Certificate and more.